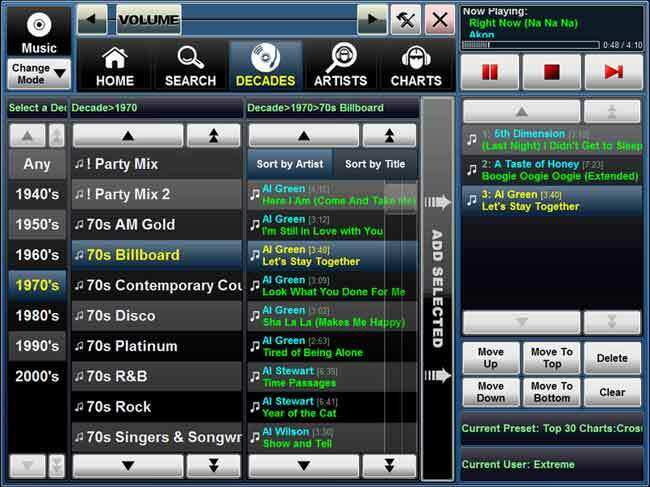 Jukebox Jockey Media Player supports music, videos, and karaoke downloads and makes it easy to make and manage requests. The software's advanced user management functions give you full control over your jukebox. The software can be used in background music systems, digital or touch screen jukeboxes, or dj software. - Browse and search your jukebox easily with the software's advanced views. - Drag and drop music, video, or karaoke songs into the queue. - Send your video or karaoke to a second monitor. - The jukebox can be configured with user permission settings so you can control who has access to your computer. - Random Play Filters ensure the music doesn't ever stop playing, even when no requests have been made. - Random Play Filters are made by dragging and dropping a decade, genre, artist, playlist, or other object into the request list. - View your media by Artist, Title, Genre, Decade, Album, Playlists, or any other way you can think of! - Custom definitions can be created for new views. - Create a database of playlists and import it directly into the software. - Fully integrated with popular online playlist builders such as DJEventPlanner and DJIntelligence. - Infared remote control support. - Browsing and searching massive media collections has never been easier, even on a modest system configuration. - Use Jukebox Jockey Media Player in your touch screen jukebox, background media player, karaoke machine, or as dj software.